Much has been written and debated regarding the influence of Emanuel Swedenborg on the English poet William Blake. Blake’s handwritten notes in the margins of his copies of Swedenborg’s Divine Love and Wisdom, for instance, and his ironic references to Swedenborg’s ideas and other-worldly visions in poems such as The Marriage of Heaven and Hell, suggest that he was inspired by Swedenborg but not uncritically so. Blake, like Swedenborg, experienced recurring visions of people who had died and passed into the spiritual world, and like Swedenborg he was immersed in the study of the Bible from a young age, making biblical symbolism an especially effective means for theological and poetic expression. It is Blake’s apocalypticism, however, which may be the most fruitful area for comparison. Blake’s The Everlasting Gospel, for example, a poem wedged into empty margins of his notebook near the end of his life, reveals an affinity to Swedenborg’s concept of a spiritual apocalypse in the present day, even if Blake’s biblical iconoclasm is at odds with Swedenborg’s commentaries. Both Blake and Swedenborg use the book of Revelation, but they do so not to predict an impending divine judgment or the bodily return of Christ to earth. Instead, they use the book as a means to critique the Christian Church of their day; to call Christians away from blind allegiances to clerical authority; and to urge their readers to wake up and realize a new potentiality for spiritual freedom and enlightenment. Nevertheless, while Blake’s Gospel is dissonant and at times light-hearted, it is by no means unserious. His concerns are ultimate ones; his message is urgent. This is made evident by the poem’s dependence on the imagery and language of the biblical book of Revelation: the promised final judgment on humanity. Blake reflected the shifting epistemological fault lines of his day that were brought on by conflicting orthodoxies and attacks made by deists and freethinkers. Stable notions of the inerrancy of scripture and progression of religious history were undermined. And in certain circles at least, millennialism reemerged in the expectation of a new era of liberation from the Church rather than the validation of the Church through Christ’s return. Blake’s work, the product of English utopianism, does not describe the end of time or any literally chronological scheme of events. Rather, his “end” is in the present tense. His Last Judgment is the event of being awakened from a deep sleep. His prophecy announces a new consciousness. Kathleen Raine describes Blake’s apocalypse as a “destruction of a texture of illusion.” “To Blake,” she writes, “the Last Judgment is enlightenment, it is the opening of our inward sight which enables us to see things as they really are. That is why it is ‘last’; for it is absolute, no further possibility remains for opinion or speculation.” The wrath of God promised with this event is not the literal punishment of the wicked or the reward of the righteous but is instead the revelation of our true nature. When considering Blake’s choice of a title for the poem, some scholars have pointed to the use of this phrase among dissenting sects in nineteenth-century England. 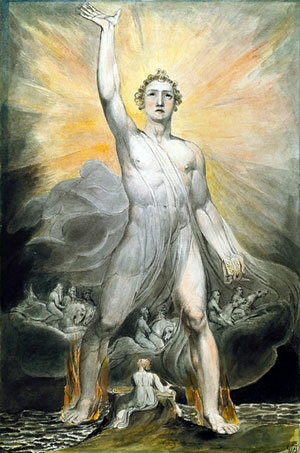 In the context of such movements as the Ranters and Muggletonians, “The Everlasting Gospel” referred to a new revelation of the true meaning of scripture, which was to usher in a new “Age of the Holy Spirit.” The accompanying antinomianism was certainly an aspect of Blake’s worldview, and his alternative gospel can be interpreted in light of the spirit of reinterpretation that such groups inspired. However, for Blake the dangers of authoritarianism were too great a risk to align himself with the creeds of any organized movement. His influence by and ultimate rejection of the New Church movement of the English Swedenborgians demonstrates this dynamic. However, Swedenborg serves as an interlocutor for Blake especially on the topic of the Last Day, and Swedenborg’s vision of an apocalypse that unveils itself in the process of individual spiritual regeneration and in the shifting consciousness of humanity as a whole, provided a productive theological and visionary basis for Blake’s present-day eschatology. A cursory study can be made with just one section of this lengthy poem. Section kbegins with the simple question: “Was Jesus Humble or did he / Give any Proofs of Humility”? Such a question anticipates the obvious answer of Christianity, whose messiah arrived as a helpless baby, born in a stable one silent night. However, Blake makes the contrary argument, drawing out all the evidence he can of Christ’s disobedience to authority, including his own parents, and of his destructive wrath. Caiaphas, his priestly accuser, returns throughout the poem and reflects the satanic “accuser” of the apocalypse (Rev 12:10). Caiaphas’s role as antagonist accentuates Jesus’s defiance: “He did not die with Christian Ease / Asking Pardon of his Enemies / If he had Caiaphas would forgive / Sneaking submission can always live.” A humble Christ would have deferred to Caiaphas; but in doing so, he would have been an “Antichrist Creeping Jesus.” Blake associates such an antichrist with the elders and priests of the community, alluding to the “Synagogue of Satan” from Revelation 3:9. For Blake, the synagogue and its scribes and the Temple and its priests are all figures of a corrupt, authoritarian religion. The phrase “the everlasting gospel” comes from Revelation 14:6–7, which is part of a series of heavenly visions ushering in a new era: “And I saw another angel fly in the midst of heaven, having the everlasting gospel to preach unto them that dwell on the earth, and to every nation, and kindred, and tongue, and people, saying with a loud voice, Fear God, and give glory to him; for the hour of his judgment is come.” Taken on its own, this verse says very little about what exactly the new gospel might be. Is it a New Testament gospel? A more perfect version of one of the gospels? A spiritual sense of scripture? This is not clear. What is clear, however, is the audience to whom the gospel is given. And here is the point that I believe caught Blake’s attention. If we back up and consider these verses in context with those that precede them, we find that two gatherings are described. The second, to whom the everlasting gospel is presented, is a gathering of every “nation, and kindred, and tongue, and people.” This is in stark contrast to the first, who number exactly one hundred and forty four thousand from among the tribes of Israel. Members of this assembly, selected from among God’s chosen people, are described as being without flaw, perfect in their sexual and verbal purity. “These are they that were not defiled with women; for they are virgins . . . And in their mouth was found no lie: they are without blemish” (Revelation 14:4–5). As we see in section f of the poem, the “dark pretense to Chastity” is “blaspheming love” in Blake’s view. Such virginity represents a false purity that gets in the way of true religious expression. The fact that no lie passed their lips is also an interesting detail when considering Blake’s use of irony and manipulation of the biblical narrative in order to create meaning. The path to truth is literary rather than linear. A lie is a necessary means to procuring the greatest truth. We find elsewhere in Revelation 10:10 a gospel that manifests as a lie in the mouth: “It tasted as sweet as honey in my mouth, but when I had eaten it, my stomach turned sour” (Revelation 10:10). This trickster gospel is Blake’s everlasting testament. If we imagine two gospels, then, the gospel of the one hundred and forty four thousand is offensive in its perfection. But the second everlasting gospel given to everyman is the “crooked road without Improvement” that earns our poet’s respect. Thus, though Blake’s ironic twists and narrative upending of the biblical account is in many ways at odds with Swedenborg’s reverent commentaries, his message of awakening and freedom from structures of authority and religious coercion were indebted, to some degree, to a Swedenborgian hermeneutic. Blake’s gospel is the sacred text for the ritually impure: the lepers, the prostitutes, the poets. His messiah is nevertheless about serious business. He is neither humble nor gentle in persecuting injustice. His followers are kept from their sleep. His mission is a revolution of consciousness. The gospel according to William Blake is an apocalypse, ushering in the age of the liberated, enlightened spirit. That he attempts to liberate himself from the very biblical tradition that brings him such a vision is an irony that only such a gospel can celebrate. Bloom, Harold. Blake’s Apocalypse. New York: Anchor Books, 1965. Erdman, David, ed. The Complete Poetry and Prose of William Blake. Berkeley: University of California Press, 1982. ______, ed. The Notebook of William Blake: A Photographic and Typographic Facsimile. Revised Edition. New York: Readex Books, 1977. ______. “Terrible Blake in His Pride: An Essay on The Everlasting Gospel.” In Sensibility to Romanticism: Essays Presented to Frederick A. Pottle, ed. Frederick W. Hillels and Harold Bloom. London: Oxford University Press, 1965. Helms, Randel. “The Genesis of The Everlasting Gospel.” Blake Studies 9 (1980): 122–60. Moskal, Jeanne. “Forgiveness, Love, and Pride in Blake’s The Everlasting Gospel.”Religion and Literature 20 (Summer, 1988): 19–39. Paley, Morton D. The Traveller in the Evening: The Last Works of William Blake. New York: Oxford University Press, 2003. Raine, Kathleen. Blake and the New Age. London: George Allen & Unwin, 1979. Rowland, Christopher. “Blake and the Bible: Biblical Exegesis in the Work of William Blake.” Biblical Interpretation: The Meanings of Scripture—Past and Present, ed. John M. Court. A&C Black, 2003. Shabetai, Karen. “The Question of Blake’s Hostility Toward the Jews.” English Literary History 63.1 (1996): 139–52. Swedenborg, Emanuel. Apocalypse Revealed. Translated by John Whitehead. West Chester, PA: Swedenborg Foundation, 2009. From The Marriage of Heaven and Hell. David Erdman, ed., The Complete Poetry and Prose of William Blake (Berkeley: University of California Press, 1982), 38. Kathleen Raine, Blake and the New Age (London: George Allen & Unwin, 1979), 58. The Everlasting Gospel, [k]:94; Revelation 6:12. The Everlasting Gospel, [k]:88; Revelation 5:2–5. The Everlasting Gospel, [k]:95–6; Revelation 6:9–11. Robert Rix, William Blake and the Radical Swedenborgians.